This month has been dubbed Wovember. The Wovember project is all about celebrating sheep's wool, and clearing up misconceptions. Here in the UK, most people call any kind of yarn 'wool' - be it cotton, or acrylic, or anything. Shops use the term 'wool' as a marketing tool to take the positive associations of wool fiber - warmth, wicking properties, and so on - and apply them to other things that aren't wool at all. The Wovember website has a Hall of Shame set up for shops which are marketing their items as 'wool' or 'woolly', when in fact they have no wool content at all. There's also a Wovember photo competition, judged by Jamieson & Smith. The theme is '100% Wool'. Here's my contribution, which I title 'The Rainbow'. It's 10 different breeds of wool, all in natural colors, all handspun by me - part of my Fiber Sampler project. I love the diversity of natural colors of sheep - from the shiny, silvery grey of Gotland to the nearly pure white of Shetland, to the rich brown of Manx Loaghtan. 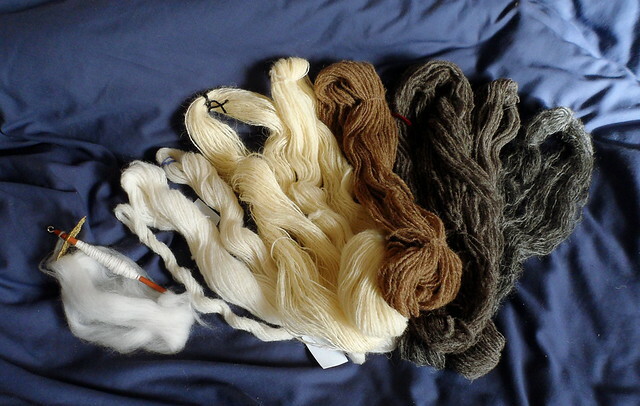 Both the Gotland (silvery grey) and colored Ryeland (dark brownish grey) I prepped myself from fleeces. Not only are the natural colors different, but the textures are drastically different - from the shiny, wiry longwools like Lincoln and Gotland to the softer, springy Merino and Corriedale. People think 'wool' is just one entity, but each breed has its own unique properties. There is not just one 'wool', there are dozens! All of them have different feels, different properties - not all wool is itchy; some is lusciously soft. Not all wool is elastic; some is shiny and drapey. There's a whole world of wool, which most people have no idea about. So celebrate Wovember and get the word out about wonderful wool!